George Raft came of unsavory background, having worked ways up gangland ranks and then sidestep to movie work where he unexpectedly hit big. From there it was necessary (so he thought) to prevent art imitating life, thus turndown of underworld topics, especially where Raft's character broke law. 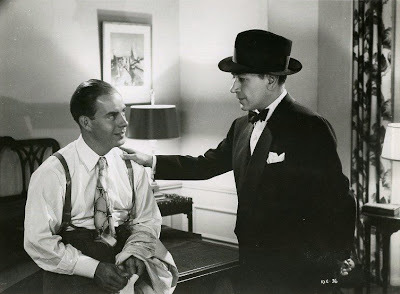 That was fair enough reason to reject parts that immortalized others (Bogart especially), but then HB came of impeccable stock and needn't have worried over confusion of self with roles. Raft had too long a success to be an altogether dumbbell, and you can't blame his preferring to play safe. Besides, he liked being a nice guy baddies steer wrong, so long as his worm turns, and right, as in Raft, triumphs. 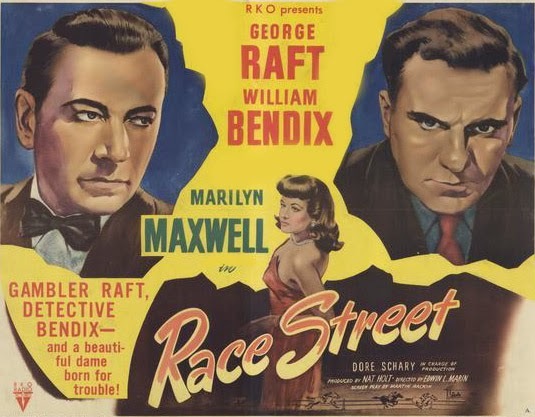 That's the direction Race Street travels, getting there the fun of RKO expertise in noir matters, with GR and Bill Bendix lolling outside Frisco's legendary RKO Golden Gate Theatre, then giving us peek at what's within. There's a double-crossing dish of Marilyn Maxwell and further victimization of Harry Morgan, who so often got it in the neck during noir's acme. Alarm came of Race Street losing dollars for RKO: they'd overspent on the negative ($913K), then realized Raft's diminished following couldn't cover the bet. Could it be that people finally realized that Raft really wasn't a particularly compelling actor? I enjoyed the previously-discussed "Nocturne" in spite, not because, of him.